Dream of becoming a Personal Trainer? 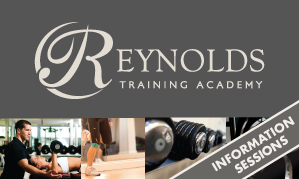 We are holding information sessions on Friday 23rd March at Reynolds Training Academy in Dartford at 10.30am and Reynolds Fitness Spa in Sittingbourne at 2.30pm about our Level 2 and Level 3 courses. Commission paid on all sessions delivered! Vacancies still available, apply before the end of March 2012. Call 01322 275807 for more information.